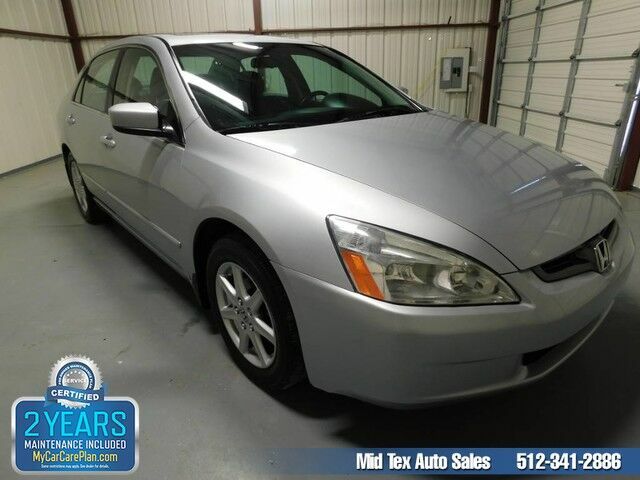 Mid Tex Auto Sales has a wide selection of exceptional pre-owned vehicles to choose from, including this 2003 Honda Accord Sdn. When you purchase a vehicle with the CARFAX Buyback Guarantee, you're getting what you paid for. Low, low mileage coupled with an exacting maintenance program make this vehicle a rare find. There are many vehicles on the market but if you are looking for a vehicle that will perform as good as it looks then this Honda Accord Sdn EX is the one! You can finally stop searching... You've found the one you've been looking for. Visit Mid Tex Auto Sales online at www.midtexautosales.com to see more pictures of this vehicle or call us at 512-341-2886 today to schedule your test drive.